If turning on the oven before work sounds like a pain, but you want to reap the healthy benefits of our baked egg in an avocado, try this even easier recipe that brings together this match made in omega-3 heaven. Hard-boil your eggs in advance for a throw-together breakfast that will fill you up with protein and fiber, keeping you surprisingly full and satisfied until lunchtime rolls around. Anyone on a low-carb plan who’s always on the go needs this naturally gluten-free recipe in their life! Peel your hard-boiled eggs and run under cold water. Transfer to a cutting board, and slice into quarters. 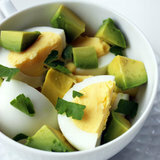 Combine your chopped eggs with the diced avocado in a small bowl or mug. Top off with garnishes of your choice, and enjoy.